About a century ago, your blogger used to teach evening classes in marketing and advertising. Okay, it might not have been quite a century ago (it was in the mid-1990s) in chronological terms, but readers over 40 are certain to recognize how the time exchange rate grows less favorable with age: as you get close to 60, a month begins to feel like a year in teen time, and perceptions of a decade increase roughly proportionately. Anyway, senile memory being what it is, your blogger clearly remembers some of the topics he taught. One of them was Alvin Toffler's ideas on "demassification." The great futurologist traced the history of mass production from the Model T Ford (you can have any color you want "so long as it's black") to the time of those evening classes. By then, you could visit your dealership and specify most cars in a very wide range of exterior and interior colors, various engine sizes, two- or four-door variants, stick or automatic shifts and with seemingly limitless options. If you were prepared to abandon mainstream taste, you could be close to sure that you were ordering a vehicle the like of which you'd never see on the road. Although your resale value was likely to suffer the more off-the-wall you got. Toffler extrapolated from that trend, and foresaw that demassification could eventually give consumers enormous power to specify the near-unique product that most suited their needs. It would be the ultimate in customization across the board. Is this where we're at today with credit cards? 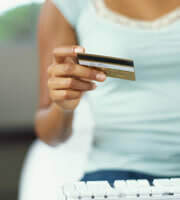 Leaving aside many card issuers' offers of customized designs, your blogger decided to count up the number of products that appear on the full credit card list on IndexCreditCards.com. Yeah, right. He may be getting on a bit, but even he has better things to do. There are hundreds there with names that begin just with A. There must be many thousands across the entire alphabet. So is this the fulfillment of Toffler's prophecy? Are credit card companies offering such an incredible range of choices that everyone who has a decent credit score can find the card that suits them perfectly? In theory, probably, yes. But another of your blogger's erstwhile favorite topics was "confusion marketing." According to Cambridge Dictionaries Online, this means "selling products or services together in a way that makes it very difficult to decide which company's products or services are cheapest." In other words, some suppliers collude (not necessarily in a formal cartel; just because they all recognize that it's in their best interests) to make it difficult for consumers to differentiate between a good deal and a bad one. You might think that this happens in the cell-phone service-provider industry. It may be possible for you to find the best possible mobile deal, but only if you have the time to analyze in great depth your last six months' billing statements so you know how your usage breaks down: calls, SMSs, MMSs, downloads… In order to compare deals you need to know in detail how you've used your phone in the past -- and you also have to make a judgment about the likelihood of that usage changing in the near future. There's zero evidence that there's a cartel of credit card companies colluding to make it difficult for you to choose the best product. And you can see why there wouldn't be: they each would like your business. But there's no denying that reducing the merry-go-round of "churn" (when a consumer leaves one issuer for a different one, and another quits that company for a third, and yet another moves on, and every purveyor of plastic ends up with roughly the same number of customers at the end of each year) would save the industry millions or billions every year. How you use your cards; especially whether you ever carry a balance forward into future billing cycles. If you do, you may need one or more low interest credit cards. Whether you're willing to take the time to actively manage your rewards or whether you want to sign up for more straightforward (though apparently less generous) rewards credit cards. How valuable the perks offered by some credit cards (especially travel rewards cards) are, and how they stack up against annual fees. What's important to your own individual lifestyle, so you can find the rewards and perks that best enhance it. The reality is that making serious savings on plastic is potentially as difficult as making them on cell-phone usage. Luckily, comparison-shopping websites such as IndexCreditCards.com and CardRatings.com can provide you with shortcuts so you don't have to spend as much time as you would if you had to trawl through all the issuers' individual sites. It's true that you'll have to invest hours in analyzing your previous usage (and estimating how that might soon change) in order to be sure you get the very best deal. But a few minutes could well find you something better than you currently have. 0 Responses to "Spend five minutes and choose a better card"